I don't often cook the same thing twice. I mean, we have the same category... "hamburgers" or "fajitas" or "pasta," but there are wide variations on the theme. There are three or four recipes in my repertoire, however, that cannot and will not be altered. The recipes are so good that they admit no substantial changes (though slight tweaks will always be acceptable). These recipes also show up fairly regularly on the meal plan because I know if I want a sure winner for dinner (unlike some of my experiments), I've got it. I make this meal for company, as a celebratory dinner, when my husband is having a bad day, and on occasion... just because. For the marinade and sauce, place the chicken in a Ziploc bag; set aside. In a large saucepan, combine the chicken broth, orange juice, zest, vinegar, soy sauce, brown sugar, garlic, ginger and cayenne pepper; whisk until the sugar is fully dissolved. Measure out ¾ cup of the mixture and pour it into the bag with the chicken; press out as much air as possible and seal the bag, making sure that all pieces are coated with the marinade. Refrigerate 30-60 minutes, but no longer. Bring the remaining mixture in the saucepan to a boil over high heat. In a small bowl, stir together the cornstarch and cold water; whisk the cornstarch mixture into the sauce. Simmer, stirring occasionally, until thick and translucent, about 1 minute. Off the heat, stir in the orange peel (if using); set the sauce aside. For the coating, place the egg whites in a pie plate and beat with a fork until frothy. In a second pie plate, whisk together the cornstarch, baking soda and cayenne until combined. Drain the chicken in a colander or large mesh strainer; thoroughly pat the chicken dry with paper towels. Place half of the chicken pieces in the egg whites and turn to coat. Transfer the pieces to cornstarch mixture and coat thoroughly. Place the dredged chicken pieces on another plate or a baking sheet. To fry the chicken, heat the oil in an 11- to 12-inch dutch oven or straight sided sauté pan with at least 3 qt. capacity over high heat until the oil reaches 350° on an instant read or deep fry thermometer. Carefully place half of the chicken in the oil; fry to golden brown, about 5 minutes, turning each piece with tongs halfway through cooking. Transfer to a paper towel lined plate. Return the oil to 350° and repeat with the remaining chicken. To serve, reheat the sauce over medium heat until simmering, about 2 minutes. Add the chicken and gently toss until evenly coated and heated through. Serve immediately (with steamed broccoli and white or stir-fried rice). *Actually at that fateful meal, I made this version (with chicken) which I still much prefer. It has a much richer, deeper and orangey flavor, but it also takes forever to make because you have to double the sauce, add more brown sugar and a little water and cook it down until it was a really thick syrup; sometimes that takes 45 minutes! I suppose if you start cooking down the sauce at the beginning of the preparation it wouldn't seem as long... but this recipe posted here is much quicker and still provides a very tasty meal. 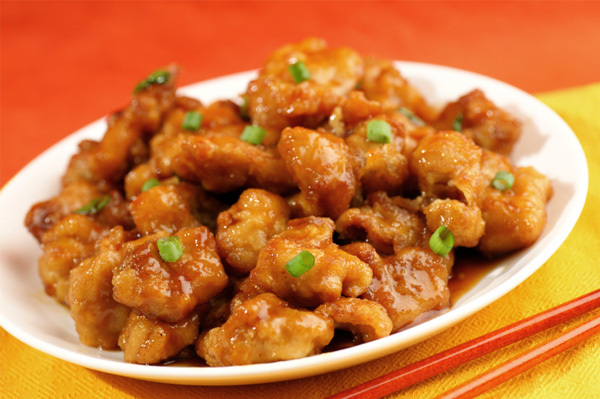 I've bookmarked this one - your sticky sweet orange chicken sounds wonderful!! Thanks for sharing it and for hosting Tasty Tuesday. Hmmm, I forgot to mention in the link above that I wrote about caramel apples. I'll have to remember next time! Definitely going to try this recipe! I love orange chicken. Sounds yummo!!! Can't wait to make it. This is my son favorite dish when we go out for dinner at the local Chinese restaurant. I will have to cook your recipe for him. Oh my goodness - I think I have to take a stab at that one for my husband! He LOVES orange chicken but we haven't had chinese food (takeout) in almost a year. It sounds a-MAZ-ing! !